Elevators are in a rut. They go up and they go down. They take people from one floor of a building to the exact same spot on another floor. A new technology has the potential to break elevators free from their vertical prisons, allowing them to move side to side, at an angle, even go outside into a city. 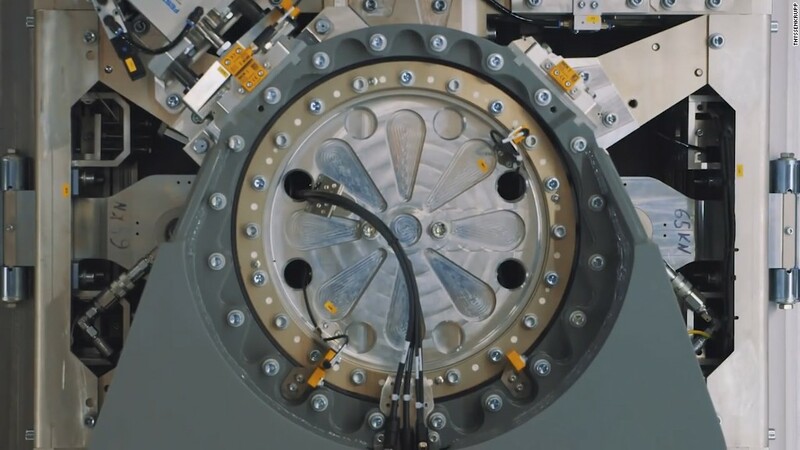 German company Thyssenkrupp has developed a new kind of elevator that uses magnetic levitation, or maglev, technology to propel elevator cabins. Called Multi, these elevators do away with the traditional suspension systems that haul a cabin up and down a single shaft. Without cables, an elevator is no longer confined to a single vertical path. A funny thing happens when elevators can go anywhere. Tall buildings, which are designed to work around a core of elevators, can start taking on different shapes. They can go wide, add multiple towers or go in unusual directions, and make room for green spaces that otherwise would have been an inconvenience. A single elevator can run from the East side of the first floor to the far West side of the 30th, no transferring or walking necessary. It gets even more interesting when an elevator leaves the building. Patrick Bass, Thyssenkrupp's North America CEO, has worked in the elevator industry for 26 years, the last 16 in research and development. He thinks these elevators have the potential to create new transportation networks to support the cities of the future. As more people migrate to cities, there's a renewed interest in creating dense, energy efficient spaces. Moving people around quickly is a huge part of that. Right now you might take one form of transportation to the train station, another to your office building, and another to your floor. An integrated network of elevators, moving walkways and autonomous cars could eventually handle the entire commute, says Bass. "You'll see a significant change in transportation, both in buildings and within cities," said Bass "You're going to see all of that start to blend together." He imagines the Multi working seamlessly with other Thyssenkrupp technology like the Accel moving walkway. The Accel, which also uses maglev technology, accelerates after you step on and can go twice the speed of a regular moving walkway. It was the first horizontal use of maglev technology outside of a train. Accel is already in use in some cities, but Multi elevators are still new. The company built a one-third scale version of the elevator in 2015. 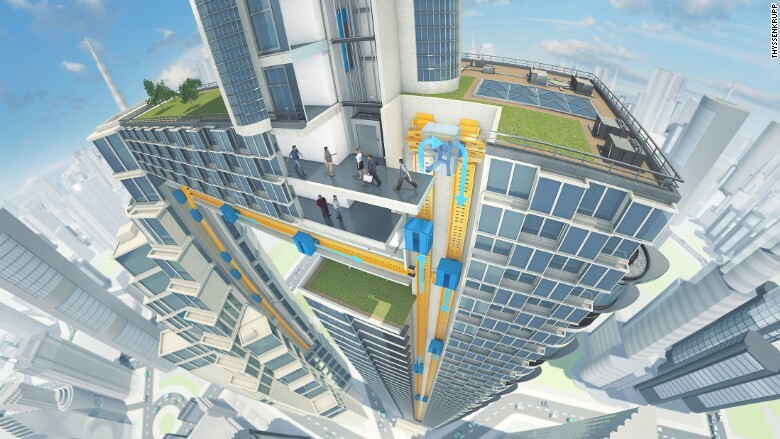 Later this year, Thyssenkrupp hopes to complete the first full-sized maglev elevator in its own high-rise building in Germany. Though the technology will initially be more expensive, it will save buildings money by having a much smaller footprint and allowing for greener building designs. The elevators can also increase handling capacity by up to 45%, even though they move slower than many current elevators to increase comfort. Thyssenkrupp is responsible for more than a million elevators across the world, but Bass sees the company moving way beyond the up and down. "We're not an elevator company, we're a transportation company," he said.